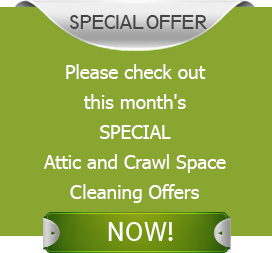 Attics and crawl spaces are not regions of our home we spend much time thinking about. In fact, these functional places are often overlooked and neglected until some serious problem draws our attention. These dusty, dingy and sometimes damp places provide the perfect conditions for a variety of hazards like unwanted intrusions, mold colonies, critters, toxic gases, dust and allergens to thrive. These threats are very real with the potential to reduce the energy efficiency at home or office, decrease real estate value and hamper a comfortable occupancy. Periodic inspections and proper maintenance of the attic and crawl space by professionals is thus imperative to stem the damage before it turns into a major fiasco. Quartz Solutions is the best in this domain. We have the best eco-friendly solutions, certified workforce and technical know-how to handle any kind of attic and crawl space issue deftly. 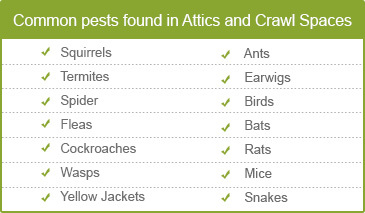 Attic and crawl spaces that are put on the back burner become an easy target for serious infestations to gain ground and cause extensive damage to the entire property. A wet and humid environment generates wood rot and structural disintegration. It also promotes the growth of mold, fungus and mildew. Dangerous spores often penetrate the living space and diminish the indoor air quality. Animals like bats, mice and rodents are a menace that destroys attic insulation, leaving behind disease-carrying waste and wreaking havoc upon electrical wiring. Pesky insects, white ants are germ carriers that spread infections. Broken ducts and soiled insulation impairs the heating and cooling capacity of the building. This not only impacts the comfort level but increases utility bills dramatically. Toxic gases can seep into the crawl spaces via cracks and trigger serious health concerns. A close scrutiny of the attic and crawl spaces is the first step towards maintaining the comfort, hygiene and safety of the dwelling. Our skilled crew will ensure that the task is done right and in a systematic way. They will drop in for a scheduled assessment and check every corner for tell-tale signs of destruction. Once they have gauged the cleaning needs, experts will chalk out a viable and pocket-friendly plan to restore the contaminated area to its original pristine condition. We at Quartz Solutions are genuinely committed to customer satisfaction and guarantee top quality services at affordable rates.